Chanukah , is an eight-day “Festival of Light”, which begins on the evening of the 25th of the Jewish month of Kislev. This year it falls on Sunday Night 2nd December. More than twenty-one centuries ago, the Holy Land was ruled by the Greeks, who sought to Hellenize the Jewish people. Against all odds, a small band of faithful Jews defeated one of the mightiest armies on earth, drove the Greeks from the land, reclaimed the Holy Temple in Jerusalem and rededicated it to the service of G-d. When they sought to light the Temple’s menorah (the seven branched candelabrum), they found only a single jug of olive oil that had escaped contamination by the Greeks; miraculously, the one-day supply burned for eight days, until new oil could be prepared under conditions of ritual purity. To commemorate and publicize these miracles, the sages instituted the festival of Chanukah. At the heart of this festival is the nightly lighting of the menorah, lighting a single flame on the first night, two on the second evening, and so on till the eighth night of Chanukah, when all eight lights are kindled. This is accompanied by the song of Maoz Tzur. 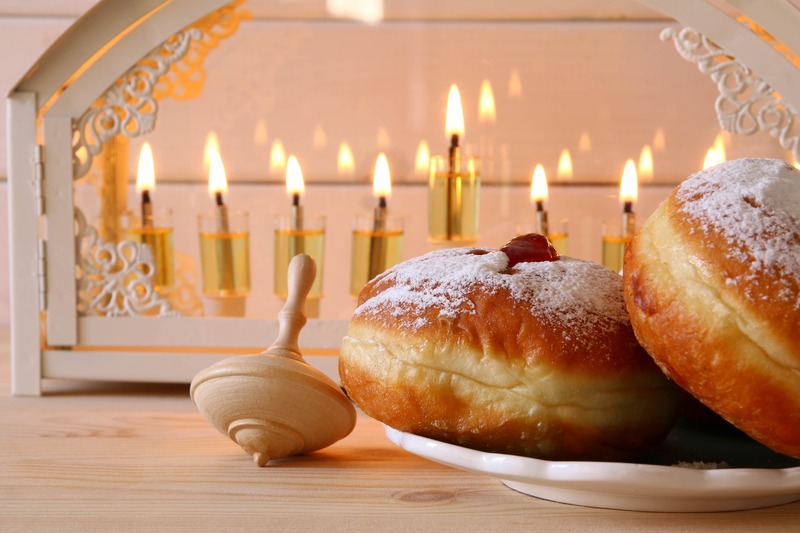 Chanukah customs include eating foods fried in oil such as latkes an doughnuts and playing with the dreidel which has inscribed the Hebrew letters nun, gimmel, hei and shin, an acronym for Nes Gadol Hayah Sham, “a great miracle happened there.